Ki Tisa (כִּי תִשָּׂא‎) – Hebrew for “when you raise up,” as in the heads of Israel to take a census for who is able to serve. It is the 21st weekly Torah portion (פָּרָשָׁה‎, parashah) in the annual cycle of Torah reading. The parashah tells of building the Tabernacle, the incident of the Golden calf, the request of Moses for God to reveal His glorious character, and how Moses became radiant. It covers Exodus 30:11–34:35. The people of Israel are told to each contribute exactly half a shekel of silver to the Sanctuary. Instructions are also given regarding the making of the Sanctuary’s water basin, anointing oil and incense. “Wise-hearted” artisans Betzalel and Aholiav are placed in charge of the Sanctuary’s construction, and the people are once again commanded to keep the Shabbat. When Moses does not return when expected from Mount Sinai, the people make a golden calf and worship it. God tests Moses with the proposal to destroy the errant nation, but Moses intercedes on their behalf. 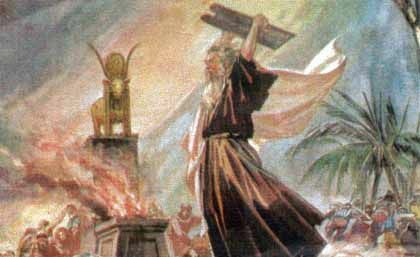 Moses descends from the mountain carrying the saphire tablets of the testimony engraved with the Ten Commandments; seeing the people dancing about their idol, he breaks the tablets, destroys the golden calf, grinds it up and makes them drink it, and then has the primary culprits put to death. He then returns to God to say: “If You do not forgive them, blot me out from the book that You have written.” Another anomaly is found in this phrase in Hebrew where Moses asks to be blotted out “from Your book” where the last letter is a Kaf Soffit which has a gematria of 20, and rather than blot Moses his name from The Book of Life, our merciful God simply blot’s Moses name from the 20th Torah Parsha… which was last week’s and the only parshat in Torah in which we do not see Moses his name mentioned! God forgives, but says that the effect of their sin will be felt for many generations. At first God proposes to send His angel along with them, but Moses insists that God Himself accompany His people to the promised land. Moses prepares a new set of tablets and once more ascends the mountain, where God reinscribes the covenant on these second tablets. On the mountain, Moses is also granted a vision of the divine thirteen attributes of God’s character. It is here in Chapter 34 that we see another amazing anomaly in Torah… three enlarged Hebrew letters revealing God’s desired relationship with us in Covenant language! (See video teaching above for more insight on this) So radiant is Moses’ face after beholding God’s character, that he must cover it with a veil, which he removes only to speak with God and to teach His laws to the people… and this is a great Truth for us as well, for if we can truly behold the matchless beauty of the Divine in realizing the depth of His selflessly loving nature, we too can be changed into his likeness and shine the Light of his Love! In this week’s haftorah, Elijah the Prophet demonstrates the worthlessness of the Baal, just as Moses chastised the Israelites for serving the Golden Calf, as discussed in this week’s Torah reading. See how Rabbi Isaac reveals the amazing model for understanding the Spirit of Elijah and Elijah’s message in the above video which unlocks prophetic understanding for recognizing the End Time Two Witnesses! 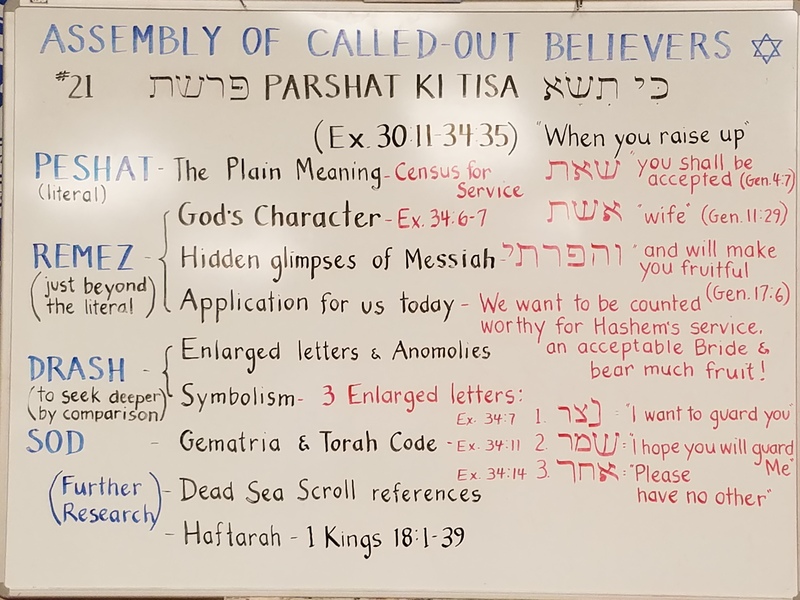 The background of this week’s haftorah: King Ahab and Queen Jezebel ruled the Northern Kingdom of Israel, and encouraged the worship of the Baal deity as well as other forms of idolatry. To prove that God alone is in control and provides sustenance, Elijah decreed a drought on the kingdom—no rain fell for three years. When Ahab then accused Elijah of causing hardship for the Israelites, Elijah challenged him to a showdown. He, Elijah, would represent the cause of monotheism, and 850 idolatrous “prophets” would represent their cause. Ahab accepted. Torah Parashah teaching with video and audio and illustrations by Rabbi Isaac. © 2019 Assembly of Called-Out Believers. Use by Permission. Awesome teaching! Your teachings have clarified many things I didn’t understand. Blessings!